Getting ready for a special event or vacation can be exciting until you realize you have a few pounds to lose first. When you are short on time, you may be tempted to turn to detox diets or diet drugs that can be unhealthy and only provide temporary results. Weight loss requires burning more calories than is consumed daily. You can lose some weight over the course of 12 days by making healthy modifications to your daily habits. Decrease your daily calorie intake. Write down everything you eat using a food journal or use an online tracking tool like LIVESTRONG’s MyPlate. Watch your calorie intake for three days to determine the average number you consume daily. Subtract 500 to 750 from your average to calculate the number of calories you need daily to lose one to two pounds per week. Consume a healthy diet to encourage weight loss. Eat foods like lean meats, seafood, eggs, fish, poultry, low-fat dairy, whole grain pastas and breads, oatmeal, brown rice, fruits, vegetables and healthy fats like salmon, flaxseed oil, nuts, seeds and olive oil. Avoid processed foods loaded with sodium, fat and refined sugars that contribute to weight gain. Consuming foods in their natural form helps you feel fuller longer without adding excess calories. Drink plenty of water to help flush toxins out of the body and minimize weight gain caused by water retention. Aim to drink at least eight cups of water per day. Drink more water if you are active or live in humid climates to prevent dehydration. Flavor your water with fresh fruits and herbs such as a lime wedge and mint or fresh lemon and sage if you find plain water too tasteless. Perform circuit-training workouts three days per week to build muscle and increase your metabolism. Do one weighted exercise per muscle group like the chest press, tricep overhead press, lunge, squat and bicep curl for one set of 15 repetitions. After each exercise, perform 30 seconds of cardiovascular activity like jogging on the treadmill. Rotate through the circuit for 30 minutes. Do 30 minutes of aerobic exercise four to five days per week to burn fat and shed any excess water weight. Ride the stationary bike, walk on the treadmill, go for a jog outdoors. Take a step aerobics or boxing class to add variety. Weigh yourself daily to track your results. 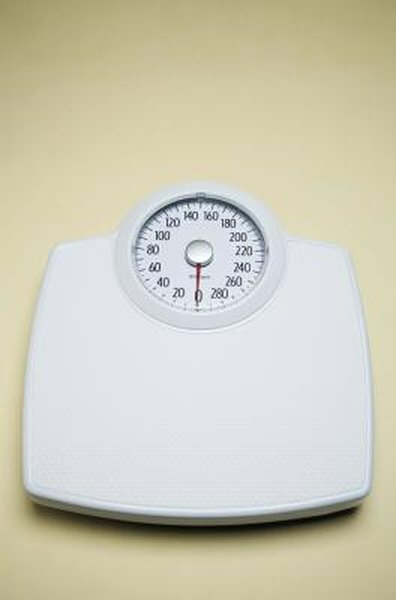 Step on the scale upon rising but after using the bathroom to determine your true weight. Don't be alarmed if your weight fluctuates day to day because this is normal, especially if you are building muscle.